After leaving Marrakech we drove eastwards to the foot of the Middle Atlas Mountains where we visited a natural bridge at Demnate. 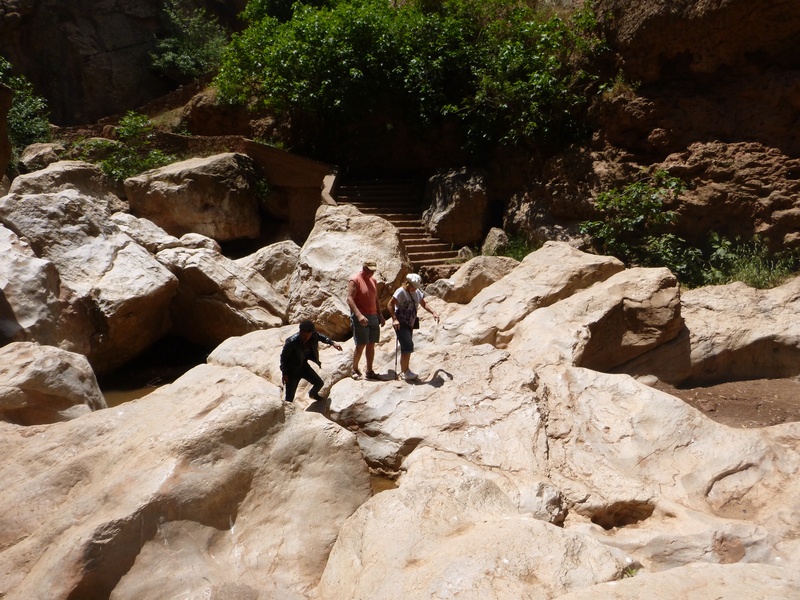 We had a guide who helped us down the steep steps to the gorge, we had to climb over some huge boulders to cross the river bed and then walked along the opposite bank. From there we could admire what they called a natural bridge where, thousands of years ago, the water plunging through the gorge had created a huge cave, the roof spanning the river high above us. Hundreds of years ago the gorge and the cave had been populated by pygmies who had dug out caves and pathways in the rock face high above us. We recrossed the river and climbed up the other side, a climb of about 400 feet. We continued our drive for another couple of hours until we came to the Cascades of Ouzoud. Our campsite was 1k away from the falls. The following morning we were taken by a guide on a walk to the falls. We walked through a village and on to the slopes where there were olive, juniper, carob and almond trees. The walk took almost two hours, following a steep, winding path down to the bottom of the gorge. We crossed the river over a some rickety wooden bridges, following a series of pools formed along the river bed. On the banks of the river on both sides were a number of camps and outdoor restaurants, set in the shade of the trees, lined with colourful carpets and divan beds where you could stay overnight. It was populated by youngsters who were enjoying swimming in the cool mountain water and following a hippy existence. By hippy I really mean they were selling Bob Marley T shirts and Rasta type hats. We followed the steep river bank all the way to the falls where the hot air was cooled by the spray from the waterfall. We took a “boat” – a raft on eight oil drums, rowed by a child no more than ten years old. He took us out into the pool below the falls, we stopped him taking us too near the cascade, and he then deposited us on the other side of the river. Here steps took us up to the top of the gorge – a lot of steps. All along the sides of the steps were open air restaurants set into the rock on terraces. There were traders’ stalls too. We watched a donkey coming down the steps at a trot, carrying bags of cement. When the bags were unloaded and the donkey was released, he walked calmly through the restaurant and out the other side and up some steps to the level above. We were very tired by the time we reached the top so we took a taxi the short distance back to our camp site. The site was run by a Dutch couple and was more European than most of the sites where we had stayed in Morocco. The lack of maintenance in most sites was a constant source of irritation to us – you would go for a shower and find a reasonable shower cubicle, reasonably clean but the shower head would be broken or missing or just taped up so the water sprayed everywhere but where it was needed – and we were taken to the best sites. Same with the loos, most of them were the traditional standing toilets but, in an effort to attract the tourist trade, a lot of establishments offered the European “throne” toilet. However, as often as not the water lying in the toilet was discoloured, not dirty but just needed a good dose of bleach; rarely was there loo paper and often the plastic toilet seat was also absent. But this was Africa.